Segnant Technologies is pleased to announce the launch of the Southwest Spine Center website. 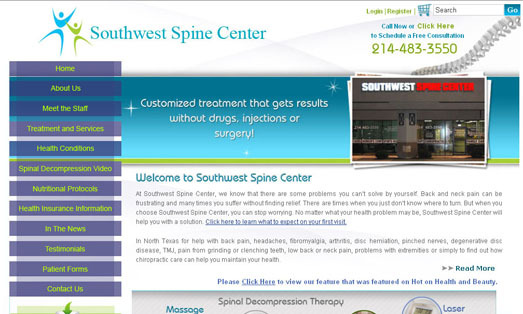 Southwest Spine Center is a chiropractic clinic located in North Dallas. Southwest Spine Center can help alleviate back pain, muscle spasms, and body stiffness. The website shows the services Southwest Spine has to offer and provides some information about the chiropractor, Dr. Ryan Bass. The website also includes a way for patients to submit their insurance information so Southwest Spine can check insurance benefits before the patient’s office visit.